If it works, the treatment could go a long way towards improving the lives of people with sickle cell disease. 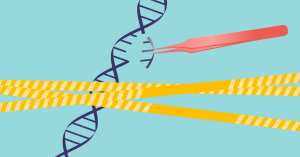 You’ve heard it before: CRISPR has the potential to change our lives for the better. But first, we have to give it a chance. In December, gene-editing company CRISPR Therapeutics announced a partnership with biotech company Vertex to develop CTX001, the world’s first gene-based treatment for sickle cell disease (SCD). Now, the U.S. Food and Drug Administration (FDA) has denied the companies’ request to move forward with a early-phase trial of CTX001 in adult volunteers, placing a “clinical hold” on the application. SCD is a genetic blood disorder in which a protein in red blood cells called hemoglobin doesn’t transport oxygen throughout the body the way it should. This can cause a host of health problems, from chronic pain to blindness to strokes. When we’re born, our blood contains a different version of hemoglobin known as fetal hemoglobin (HbF). Usually, the adult version of hemoglobin replaces HbF post-birth, but sometimes HbF remains in the blood through adulthood. When that happens to a person with SCD, it can reduce the severity of their symptoms. CTX001 is intended to replicate this rare fluke of nature in patients. The first step in the therapy is to extract cells from the patient. Then, the researcher genetically edits the cells in the lab to produce significant amounts of HbF. Finally, they reintroduce the cells to the patient’s body where they generate new red blood cells with higher levels of HbF. The lab results have at least been promising enough for the researchers to move towards human studies. But until they get the go-ahead to move forward with their human CRISPR study, we can’t know for sure whether CTX001 will work as expected. This trial, should it move forward, won’t be the first time CRISPR has been tested in humans — that first try was in China in 2016. But this trial would mark one of the first to happen in the U.S., as MIT Tech Review reports (several others, including some to treat SCD, are also moving forward, and it’s not clear which group will get there first). Hopefully, CRISPR Therapeutics and Vertex are able to answer the FDA’s questions in a way that promotes confidence in the treatment. While it’s true that we’re exploring uncharted territory with gene-editing in humans and need to proceed with caution, millions of people currently suffer from SCD. CRISPR might offer a life-changing treatment. The catch is we won’t know for sure until we try.